These views looking down Bank Road were taken from one of the upper rooms in Central Buildings on Smedley Street, where the photographer Charles Colledge lived with his wife. The top photograph, with the horse and cart, dates from 1915. The driver was probably delivering coal to the boiler house at Smedley's Hydro, which was on the right. As these carts tipped under their own weight, it was relatively easy to shed heavy loads. The first building on the left side of Bank Road as it descends the hill is only partly shown but is the Primitive Methodist Church built by John Smedley. The Sunday School he built is next door. The curve in Bank Road just below the schoolroom, where New Street joins the Bank, illustrates just how difficult an undertaking it was for the engineer who designed the Steep-Gradient Tramway. The first of the properties past the schoolroom, on the far side of the New Street junction, was a grocers in 1911, run by the Shaws (Thomas Shaw was also a hairdresser). 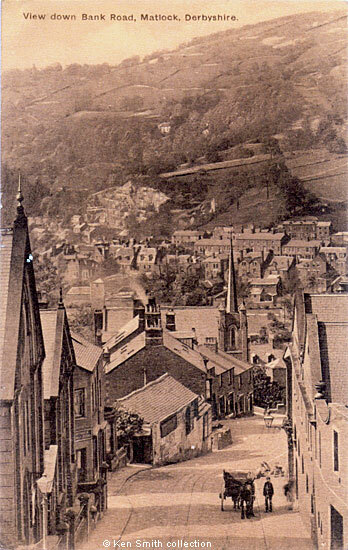 Below the houses was either a workshop or stables that was later demolished and further down the hill, with the tall spire, is what is these days Matlock Methodist and United Reformed Church on the corner of Oak Road. Dale Road can be seen in the bottom of the valley, and Masson rises skywards on the opposite side. If you look carefully at both pictures you can just about make out the Victoria Tower on the Heights of Abraham. The quarry at the entrance to Matlock Dale was already quite large when the picture was taken. 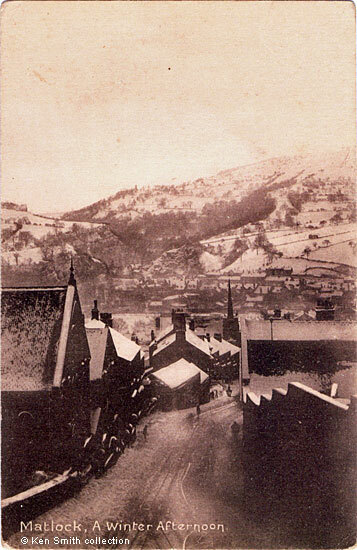 The image below possibly pre-dates the top postcard as, although it is difficult to be certain because it is taken from a slightly different angle, the quarry looks slightly smaller.